I do worry that if that's what Jo Johnson thinks are running the trains in the South West this month, does he have a proper basis for making good decisions about changes for the future? which only confirms the incompetence of the DfT. There is only 6 153s in the fleet. I think I can see what they've tried to do with the Great Western figures. Rather than picking a date during the current change-over and trying to find out what's in the fleet at that time, they have chosen to represent the "before" figures and pretend electrification isn't happening yet. That probably explains why there are all the HSTs with none gone for conversion, no IETs, and no electric fleet for the 387s to belong to. That's not a stupid idea, though they ought to have put in a note to say so! Most of those figures can be taken from the lists in the franchise agreement, with some perhaps updated a bit. Some of the numbers still look wrong, though - but without that statement of their basis I can't be sure. 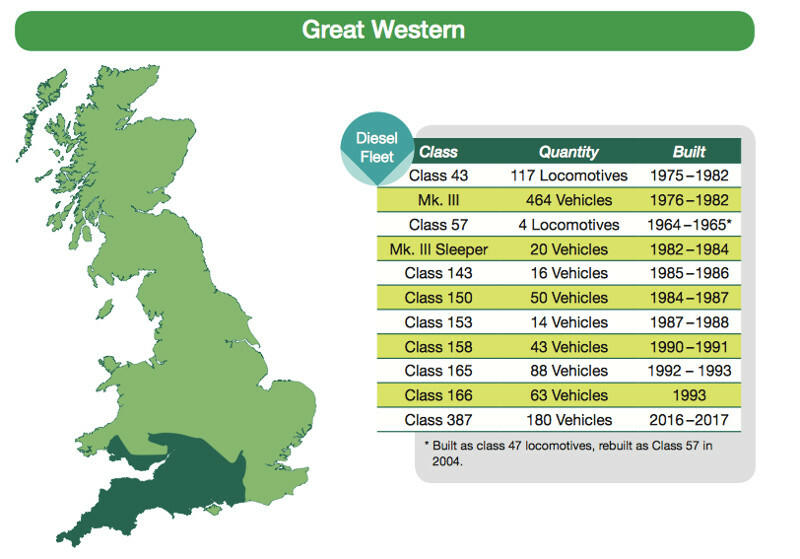 The document from the Rolling Stock Strategic Steering Group, to which there is a link, is rather more revealing. Apart from a worthy commitment to improving access for the disabled, much in the DfT publication skirts around, or does not address issues raised by the RSSSG document. Also, one issue that many forum members are concerned about (5 across seating), does not get a mention. 2 - electric trains are the most reliable, cheapest to build and run. Bi-modes cost more, and the alternatives are still untried or in development. It is as if BR said that they were relying on gas-turbine technology in the 1950s to replace steam to avoid investing in electrification. 3 - there is policy double-speak. If they are really committed to reducing emissions from rail transport the answer is to bite the bullet, investigate properly what has gone wrong with the GWML project and press on to catch up with our European neighbours in electrifying all our main lines. If diesels have to be kept going to cover the gap, why not simply re-engine with Euro-6/Stage 111B compliant engines to prolong their life, rather than expensive rebuilds as diesel electric bi-modes/ hydrogen etc? 4 - the greater cost of bi-modes presumably will be reflected in higher lease charges, hitting franchise margins, which are clearly under pressure. Their greater complexity does not indicate long term relaibility either. I've never understood what these DfT documents - brochures, really, are for. A lot of what they call for is already being done, in some cases with so little dissent it's not mentioned. The rest is, largely, pro-apple pie waffle. It probably would make more sense of DfT directly addressed the preceding RSSSG report, saying what from their viewpoint is missing from it. If diesels have to be kept going to cover the gap, why not simply re-engine with Euro-6/Stage 111B compliant engines to prolong their life, rather than expensive rebuilds as diesel electric bi-modes/ hydrogen etc? The RSSSG report has a lot on that topic. In the past they said a IIIB engine just wouldn't fit under an existing train, being a lot bigger than the old ones. They now don't quite say that, but it certainly wouldn't be a direct one for one replacement, but an expensive moving around of all the bits. Given the preference for a bi-mode if there is some electricity to be had, and for electric drives, refitting old (or not-so-old) EMUs may not look so costly. What they do say this year is that as the old engines can legally be used for many years to come, the business case for replacing them doesn't look good. By implication, only if the use of dirty old engines is made expensive or illegal quite soon would that alter. Yes to me investment in bi-modes only makes sense in the context of an on-going programme of electrification. With bi-modes eventually being replaced by fully electric trains and the bi-modes cascaded to other part electrified lines. So one part of government will only support replacement of old diesel engines to improve air quality if another part of government makes it illegal not to! RSSSG isn't part of government - it's "the rail industry", and Network Rail is its only member to be a government body. No but DfT is, and they will say whether they will fund TOCs to make the change. The use of lightweight, refreshed and re-purposed vehicles could strengthen the case for reopening disused lines, according to the Department for Transport. 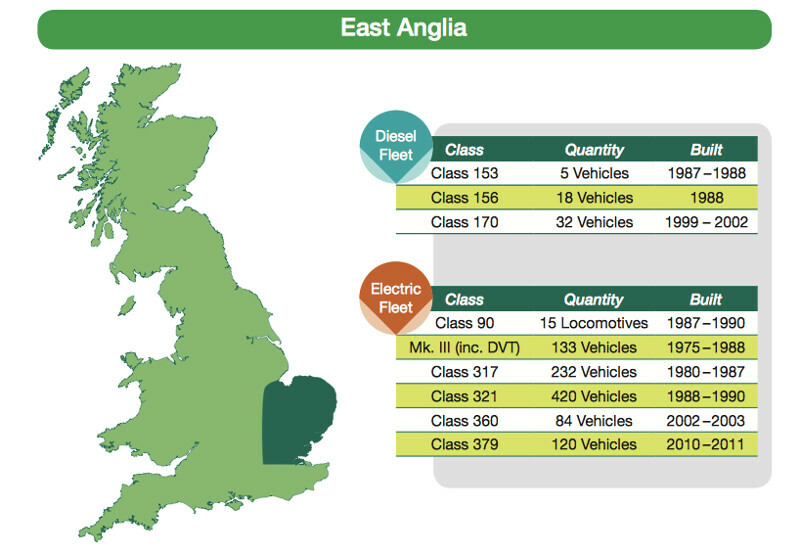 In its Rolling Stock Perspective Fourth Edition, published on October 25, the DfT highlights the hydrogen-powered Class 321's from Alstom, Vivarail’s hybrid Class 230s, and Angel Trains’ Class 165 HyDrive trains (RAIL 862). “These vehicles…offered to the market at competitive rates, could strengthen the case for the reopening of disused lines,” it says. The DfT has also called for measures to be put in place to reduce pollution at source, suggesting auto engine stop-start software, electric launch systems and station shore supplies could all be used during long dwell periods. The taskforce created to investigate the decarbonisation of the railways by 2040 (RAIL 847) will follow up its initial findings next year, with a final report incorporating an economic appraisal and route map to deliver its recommendations. The three two-car D-Train diesel multiple-units which Vivarail is producing for London Northwestern Railway will not enter service in December as had been planned, the supplier announced on October 30. The Class 230 DMUs are being produced using the bodyshells and bogies from former London Underground D78 metro trains. Vivarail said the time taken to optimise the control systems on the first unit had delayed work on the next two, and this meant the fleet would not be ready for the December timetable change. Thanking London Northwestern Railway for its patience and help with resolving the ‘few remaining problems’, Vivarail said it was confident that the DMUs would be ready for service in the New Year. The D-Train is intended to be a low-cost option for lightly used routes. 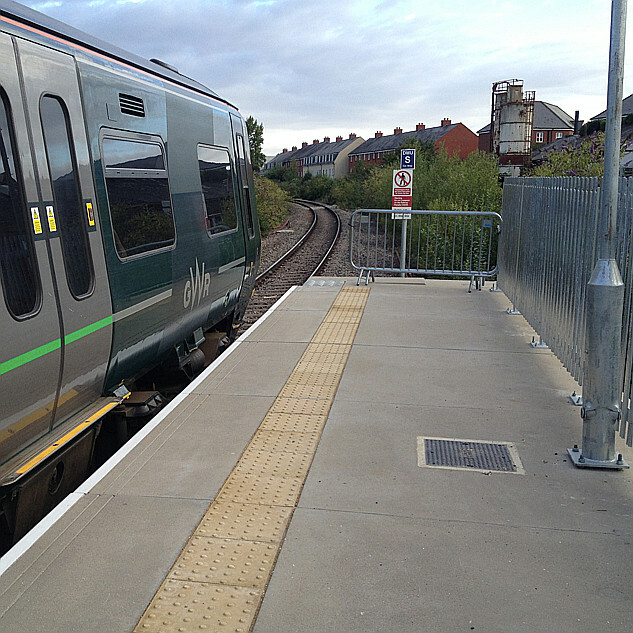 The DMUs for the Bedford – Bletchley line are to have accessible toilets, USB sockets and face-to-back seating. They will have automatic engine cut-out at stations, and be capable of future conversion to battery power. Wales & Borders franchisee KeolisAmey has also ordered five three-car diesel-battery multiple-units for use on the Wrexham – Bidston, Conwy Valley and Chester – Crewe routes from mid-2019. Can anybody give me an example of this, as currently all the conversions are from electric to diesel (e.g. classes 230, 769, 800 and 802) not the other way round? Surely most diesel trains should be converted to or replaced by electric but of course this won't happen as this whole debate is being driven by ideology at the DfT and Treasury. Currently the DfT and Treasury are lead by idelogues who believe that the public sector is always bad and the private sector is always good and of course there is also the fetishisation of the fiscal deficit. So basically it boils down to this, we can't do electrification because that is infrastructure and would typically paid for by the government and we don't want to do that; so instead we must convert existing trains as that will be paid for by private companies and that is good. Can anybody give me an example of this, as currently all the conversions are from electric to diesel (e.g. classes 230, 769, 800 and 802) not the other way round? Since almost all diesel units have mechanical transmission it is very difficult to convert them to bi-mode. There is also often very little space for extra equipment. However with electric trains it is often possible to fit a generator set in the space available that can feed the existing traction motors, so it is a much more practical option. The exception is the Midland Mainline Class 222 trains which are diesel electric I believe and therefore should be very easy to convert. It was said Class 220/221, (Voyagers), were easy to convert by ‘simply adding a pantograph & transformer carriage’ but no one could ever convince the DfT it was cost effective. I doubt 222s would have a significantly different analysis.